Southie filmmaker Mani Ratnam leaves behind his more overtly political fare (Bombay, Dil Se, Yuva) to construct a quasi-biographical human drama. Gurukant Desai (Abhishek Bachchan) is a poor, put-upon village bumpkin from Gujarat who dreams of making it big on his own steam. To this end, after an aborted sojourn in Turkey, he moves bag and baggage to Bombay, acquiring a nubile bride, Sujata (Aishwarya Rai), along the way. There, he conquers all odds to become a big time industrialist, befriended by one Manikdas Gupta a.k.a Nanaji (Mithun Chakraborty), a newspaper magnate who then causes his inevitable, albeit temporary, fall from grace. 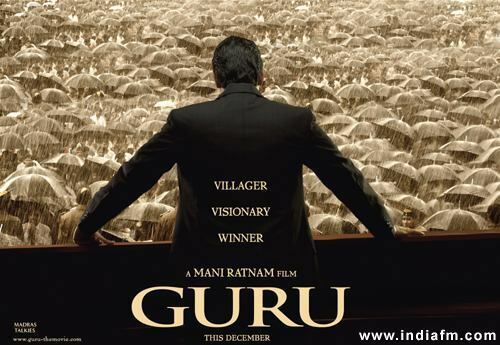 Much has been written about the fact that Guru is a loosely disguised version of the life of Reliance India tycoon Dhirubhai Ambani. The latter’s is a rags-to-riches story of mammoth proportions, and indeed he too traveled abroad (to Yemen) as a youth to seek his fortune, only to return home to sow the seeds of the company that would bring him unimagined wealth and fame. He too had to engage in a high-profile media battle with Ramnath Goenka’s newspaper The Indian Express. Even Ambani’s run-in with the Wadias is reflected in Guru’s troubles with the influential Contractors. While Mani Ratnam’s films always start off brilliantly enough, they also always ultimately run out of steam. Unfortunately, in Guru this happens much earlier on. In fact, almost as soon as Guru leaves his village of Idhar for the big, bad world of ‘bijness’ in Bombay, the script falters never to recover. The contrivances that are meant to serve to show us what a smart cookie our man Guru is, are… well, just not very impressive. We are supposed to be awed by his meteoric rise to the top, but the script fails to give us a good enough reason to be awed. Bunty Aur Babli presented its protagonists’ smarts with much more imagination and panache. Later, when Guru’s actions royally cheese off his one-time champion Nanaji, the set-up for their falling out is so weak that the ensuing war between them rings hollow, as does their predictable and anti-climactic truce. Ratnam is apparently so obsessed with following the Ambani legend to the ‘T’ that he ends up shortchanging his film. The director could have taken a cue from Orson Welles’ classic rise-and-fall saga Citizen Kane to tell us the story of a basically decent man whose ambition and success taint his soul. Instead we get ol’ Guru who’s just misunderstood, and we’re all great big sticks-in-the-mud for expecting him to be apologetic or remorseful for such trivialities as rampant bribery, manufactured profits and brazen crossing of various legal limits. When Guru invokes Gandhi as a fellow rebel in his final speech, it is close to ludicrous. It is not only Ratnam’s script that is deeply flawed; his sense of judgement as a technical filmmaker also seems to have taken the day off. The background score throughout the film is so relentless and overbearing that it makes one want to scream. The director doesn’t seem to know when to leave well enough alone and rely on his audience’s intelligence to decipher nuances and undertones. Instead, you have the jarring music punctuating every single emotion and development in the story, major or otherwise, effectively (and ironically) robbing the scenes of all their power and drama. After their failure as a pair in Umrao Jan, Rai and Bachchan fare far better here. They share good chemistry but yet again it is the script that lets them down, their ‘romantic’ dialogue passages falling rather flat. Abhishek Bachchan probably saw this as an opportunity to etch an immortal cinematic character in the tradition of the ones created by his father. And indeed, there are moments when he shines, especially in the first half of the film. But his Agneepath this ain’t. At about the midway point, when Guru starts to touch middle-age, Bachchan loses his way, elements of grating caricature seeping into his performance and body language – all glowering and jowly, like Alfred Molina on a bad day. One suspects however that this too is attributable to Ratnam. Bachchan, as evidenced by his best celluloid work so far (Sarkar, Bunty Aur Babli, Phir Milenge), is very much a director’s actor, so one can conjecture that it was his director who was sleeping on the job. Aishwarya Rai’s Sujata, while a better-than-usual interpretation on the part of the actress (though one can’t help but wonder what Tabu could have done with the part), is nevertheless a stereootypical Mani Ratnam heroine: spring-fresh village belle – pure and innocent, yet spunky and bold in love. Remember Roja? Of course the film has its plus points, not least of which is the luscious cinematography by Rajiv Menon, as well as the sweetly soulful song score by A. R. Rahman. Madhavan, in the thankless, next-to-pointless role of intrepid reporter Shyam Saxena, turns in a quietly intense performance, and the man looks damn fine too. Unfortunately, a few tasty morsels do not a great meal make. And as it stands, this Guru just doesn’t have enough meat on his bones.